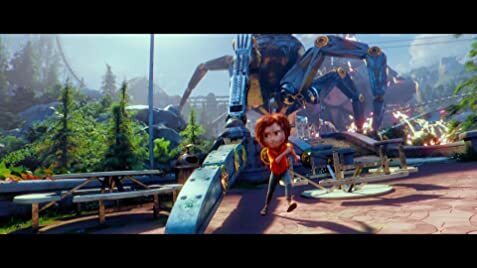 Wonder Park, written by Josh Applebaum and Andre Nemec, is a touching film and a magical adventure. It is filled with action, humor and heartfelt moments that make it enjoyable. The movie is all about the power of love and imagination. It is a wild ride of fun. The movie tells the story of a young girl, June Bailey, (Sofia Mali and Brianna Denski). She is very imaginative and adventurous, which shows throughout the movie. She and her mom (Jennifer Garner) have a very close relationship. Together they invent a theme park called Wonderland, based on figments from June's imagination. It is a whimsical place filled with exciting rides and attractions, such as a flying fish carousel and crazy roller coasters. The park has great characters like Boomer, the narcoleptic bear and Steve, a gentle porcupine. There is also Greta, a feisty hog and a beaver Cooper played by the hilarious Ken Jeong. My favorite character is the monkey Peanut (Norbert Leo Butz), the leader of the park. He is such an endearing character. When June's love for the park is tested, the magic of what she and her mom created begins to disappear. It's up to June to save the park and herself. The plot is creative. I like the animation and the magical looking effects. I love the vision of the park and the details that capture the theme of a child's mind. All of the areas of the park are vibrant and unique. I love the bendy straw slide and the balloon cove. The scenes match the mood of what occurs in the storyline. One of my favorite parts is when June first comes to Wonderland and sees that her creations are real. The movie has some emotional moments between June and her mother. We see how June goes from being a happy-go-lucky kid to a sad little girl. We watch her love for the park fade away. However, we see her get her shine back. It is a great story about relationships and the importance of imagination and always believing. I rate this film 4 out 5 stars and recommend it for ages 3 to 13, as well as the entire family. Ken Jeong's seventh Animated Film, after Despicable Me (2010), Monsters University (2013), Despicable Me 2 (2013), Turbo (2013), Penguins of Madagascar (2014), and Norm of the North (2016). Throughout the closing credits, the chimp dolls are shown in various costumes. At the end of the credits, June is seen.